The winner is Lucy who was nominated by her husband, Anthony (all the heart eyes!). My romantic side got the better of me when I picked the winner – congrats, Lucy! I know I go on a bit about my room makeovers but it’s only because I get so excited about making a space feel like new, either with relatively small touches or much bigger changes. My living room makeover is very nearly done (still waiting for a couple of new pieces of furniture) and it has made my home feel like new. 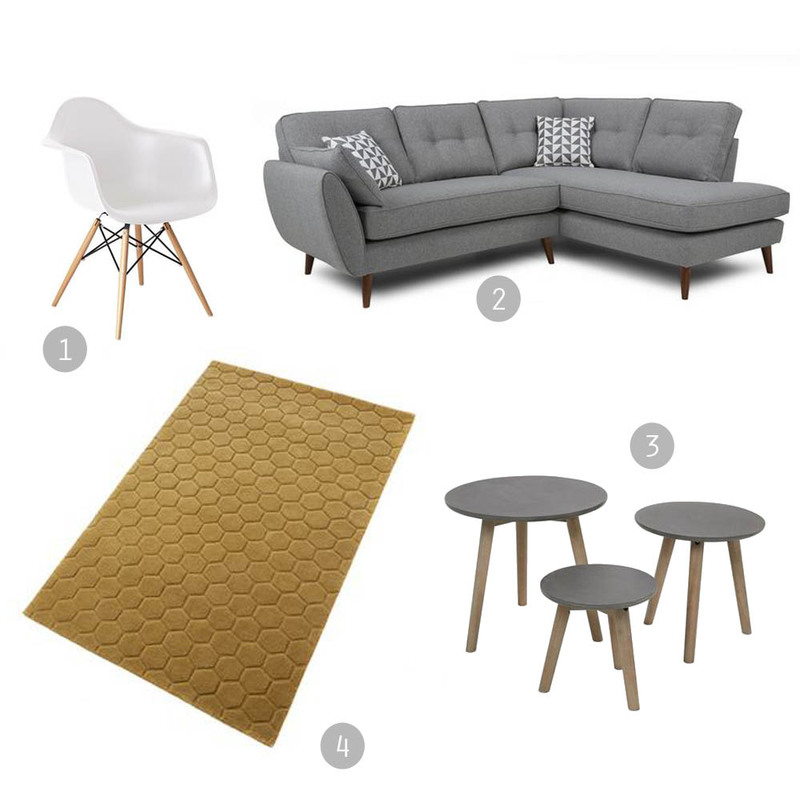 I am beyond excited about the fact that I can now offer YOU a living room makeover with the lovely folks over at DFS. Eeeek! To celebrate International Women’s Day, we would like you to nominate an inspirational woman in your life (whether it be your best friend, partner, sister, daughter, mother, neighbour) for the chance to win a new look for their living room. 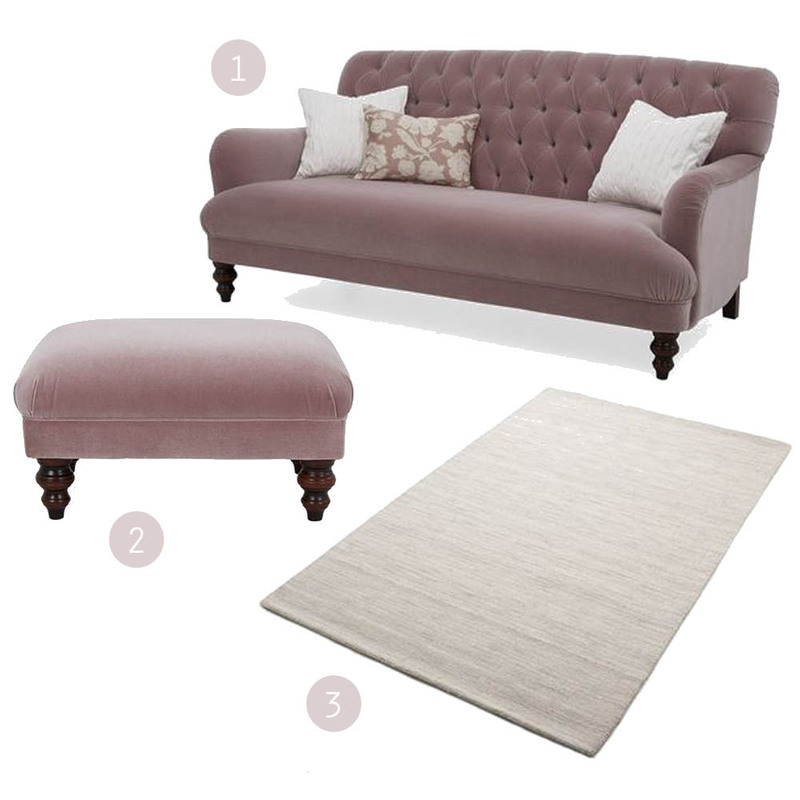 I have chosen four collections of furniture from DFS that I love (GIVE ME THAT PINK SOFA NOW!) and it was ridiculously difficult to choose just four – gutted I couldn’t include this sofa too. The lucky winner can select the collection that they like best as well as sending me a few snaps of their living room and I will help them place the new furniture and suggest ways to make the whole room look better. Once the makeover is complete I will then post some photos of the new look room here on my blog. I love the clean lines of this sofa designed by French Connection and the touches of black in the legs and cushions bring an air of sophistication. The bronze table frame adds a bit of glamour – I feel the need to be on that sofa right now drinking a cocktail! This literally is my pink dream and I hope it is yours too! I’m imagining us all in a cottage somewhere with this beautiful Bailey sofa, footstool and an open fire – I mean, what else would one need in life? Keep this furniture fresh and modern with crisp white walls or soft greys, neutral flooring and dots of bolder colour from vases filled with flowers. Heaven. 1. Bailey velvet sofa in dusty pink 2. Bailey velvet small footstool in dusty pink 3. Blackford rug in sterling. 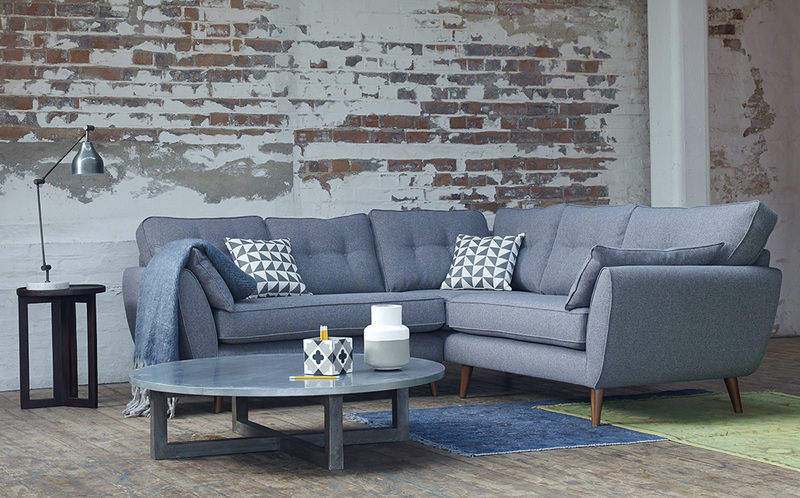 Retro lovers out there this chaise sofa with mid-century style legs would be the perfect addition to your home. Combine it with pops of bold mustard, orange, green or blue and an original teak sideboard would finish off the look brilliantly. 1. Eiffel armchair in white 2. 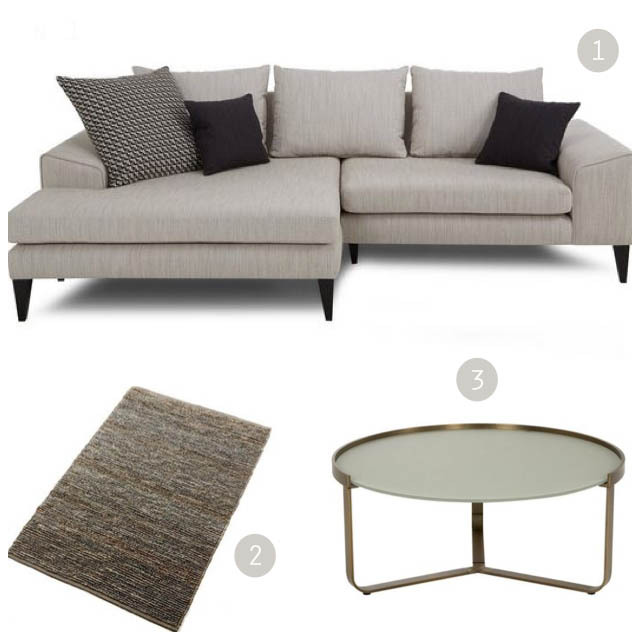 Zinc chaise sofa in grey with light legs (size and shape of sofa your choice) 3. Trio nest of tables 4. Wall rug in gold. For those of us who like to escape into white tranquility I have chosen this beautifully simple Slate sofa and armchair. I’m imagining a coastal feel in this room with lots of white, raw wood, neutral ceramics and wild flowers. You could also add an accent colour to lift the look – perhaps blue to add to the coastal feel. Decide who you would like to nominate (or ask someone to nominate you) and leave a comment on this post telling me why that woman is an inspiration to you and why you would like them to win a room makeover. I will choose the winner on March 22nd and announce it here on my blog. The winner will need to send me a few pics of their living room ‘before’ and ‘after’ because we all know how much I love those! I can not wait to hear about the special women in your lives and good luck. *Thank you to DFS for collaborating on this fun project. THIS COMPETITION IS NOW CLOSED! WINNER WILL BE ANNOUNCED ON WEDNESDAY 23RD MARCH. – Competition closes on March 22nd at midday. – Open to residents of mainland UK only. – The winner agrees to sending me pictures of their living room so that I can give them advice on ways to improve the room. They also agree to sending me a few snaps of the living room once the furniture has been delivered and the room makeover is complete. -This prize is non-transferable and cannot be exchanged for monetary value; No cash alternatives to the stated prize will be offered. – One nomination per person. What a fantastic giveaway! I’m going to nominate my friend Lucy. Her house always looks amazing, and she has this wonderful talent for turning things she finds at the tip into treasures! She is always on a budget though, so I’m hoping she would LOVE the chance to be properly spoiled. I would like to nominate my mum Jean, she has the most beautiful home but still looking out for the perfect sofa. Also she helps look after me and my five boys so she deserves a extra special treat. I nominate my sister, Lisa, who is the funniest and most resilient person you can imagine. Tragedy struck a few years ago when her husband had to stop working after a horrendous accident. With three children and a dog, she has managed to keep the family afloat by working flat out at a children’s nursery, walking other friends‘ dogs and picking up bargains at car boot sales. Although she has so much to deal with, she’s always laughing and has a hilarious sense of humour. I would so love to give her the chance of having her living room re-done. She would get so excited. I nominate my mum as she has always inspired me to make an effort with myself and my home. She was always proud of her appearance and was constantly changing things around at home. She taught me that it’s not essential to spend a huge amount of money on style, but also to never settle for the cheapest option. I nominate my mom because she has always been my style and decor inspiration, on top of being such a strong single woman throughout her life in general. She is the first person I call anytime I buy a new piece for my home, or when I am moving in to a new place and need decor or organization advice/HELP. I nominate my mum who raised me on her own and sacrificed so much for me. She has always had hand-me-downs and had to ‘make do and mend’ way before it was ever in fashion and she’s never had the luxury of doing up a room of her own to her tastes. I wish I could afford to pay her back for everything she has done for me and continues to do for my boys, as she tirelessly looks after them and even makes our tea. This would make such a difference to her life , which is why I’d like to nominate her to win! What a lovely competition. I nominate my Nana June, who died just before Valentine’s Day. She had a council house in Stoke and was the most tireless housekeeper I have ever known, despite losing my granddad and having some physical challenges – her house was always spick and span and cleaning out her belongings last week brought home to me just how warm and welcoming her home always was. She had lots of quirky things but (even though she’d be mortified at me posting this) also had the most elegant taste possible and worked so hard to keep a lovely home. Her home will always represent love and warmth to me. I will miss her so much but I’m lucky enough to have been given some of her ornaments and knock knacks, which I would love to display properly in our cluttered and confused living room…! I nominate my gorgeous little sister, Charlotte. She got pregnant at 18 and we all thought this was the worst thing that could have happened but now she has the most beautiful 3 year old who we wouldn’t live without. I’d love for my big sister Suzy to win this. She has a busy house with three kids and a dog and not much spare time or cash to update it. Her sofa is knackered to be blunt! A new one would be an amazing treat for her and a big corner one would mean they could all pile on! I would like to nominate my best friend Heather. Aside to the fact she is one awesome human being, she has spent so many years living in rented accommodation with house mates. Last year she finally moved in to her very own place. I am so proud of how hard she has worked and what she has sacrificed to be able to take this massive step in her life. She spends her working life educating kids, working with dementia patents and the homeless in a museum. She is a truly selfless woman who is always there whenever I or any of her friends are in need. I nominate my mom, MARCELA. She’s one of those who seem like a tough nut to crack (probably because she is haha) – definitely where I get my stubbornness from, But she’s also the most caring person I know. Oh that pink sofa is a dream! ANd to have you give advice on my space – darling I need that. I would nominate my dear Nana. She passed away in January and was the soul of our family. She is massively missed by us all. On Sunday 13th she would have 90 years old. It’s going to be a tough day for us all. I would love to nominate my Nana. I’m shaking my head and smiling at what to write about her, but the facts say it all. She is 101 years old, but with a really keen eye for design. She’s never had much money (four children to raise after her husband died following being gassed in the FIRST World War- he was twenty years older than her) and yet her living room is always different, every time I visit. Plants and paintings come and go, as does furniture – but she has always had to make do with second hand and would be amazed if she could actually choose something! She’s also recently lost her little dog (she’s had one all her life but finally conceded that, at 101 she can’t walk one anymore, so Pandora has left a big hole) and needs cheering up! I’d like to nominate my amazing mum to win the coastal white sofa. Her lounge is looking a little tired and unloved and could do with a ‘mini’ makeover. She lives near the water and I think a ‘New England’ style would look ace.She is the most lovely person and everyone wants to adopt her as their mum. She is totally selfless and always puts others before herself. She’s had a tough couple of years with family members passing away and deserves a treat. Thank you. Katie I love this competition so much! I would nominate my friend Jo who recently moved house… then made redundant. She is a tireless advocate for others but is utterly crap at putting herself first! She is incredibly strong and has dealt with a lot in the past including multiple miscarriages- but remains an incredible support to new Mum’s in our community. Her mum is in and out of hospital at the mo and man, she needs a break! Happy international women’s day to you, lovely lady. I love this online space you created. Wow what a wonderful prize, thanks Katie and obviously DFS too! It might be an obvious choice but I select my wonderful mum. She has sacrificed so much for my brother and I and she’s going through a pretty tough time at the moment and I know she really needs a pick me up, this prize would be so lovely for her. She’s been meaning to spruce up her living room for a while and as she’s an interior designer I think she would just love this prize! I especially love the pink sofa too! My mum. Very simple. She inspired me all my life, still does today. She had many, many knocks in her life, most would have crumpled but not her. She stood firm and true, in her beliefs, and in how she believed others should be treated, even though at time she had been badly treated herself. She taught me how to walk in another’s shoes, she taught me about empathy and kindness. She taught me about respecting others. She taught me about humanity. My mum was a fighter, a warrior. Even in her last moments she clung onto life, surprising everyone around her. She was, and still is, an amazing human being. So, really annoyingly we have just bought a new sofa but I wanted to say that you have blown me away with these DFS choices. I would NEVER have thought to have looked there – I’m actually quite gutted because I think I like that first one more than the one I’ve just bought!! Grrrr. Can you do a bedroom makeover comp next time because I would like to be first on the list!!! I would like to nominate my mum. Over the past three years she has been divorced, moved house three times, and has recently had her dog put to sleep. She has also started her own business from scratch. She is finally settled in a nice house but is finding it hard to get it sorted whilst focusing on her business too. It currently looks very cluttered! I think she’d love to win this. 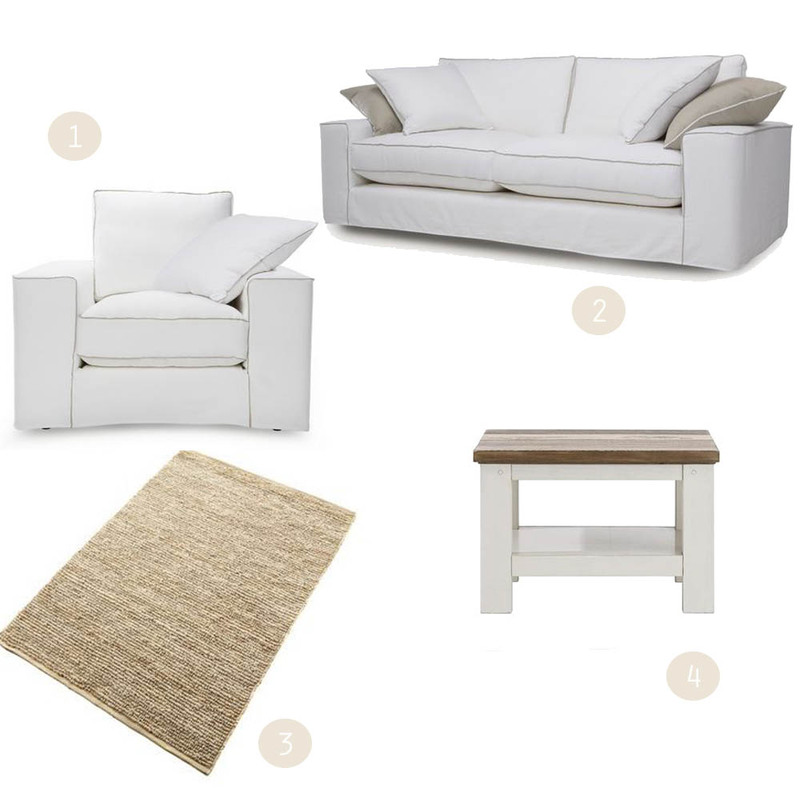 Just loving this giveaway Katy and of course the sofas are dreamy! The pink button back is perfection. I’d like to nominate my instafriend Simone. We’ve never met, but she’s a hardworking, home-schooling mum with vintage flair and I know she’d love one of these beauties. Not to say that she has a shabby sofa ( I’m sure it’s not at all) but who wouldn’t want to win one of these delights! I’d like to nominate an inspirational daughter who has a warm heart but a cold house, as she and her husband are just building themselves (very much with their own hands) an extension which will badly need furniture! 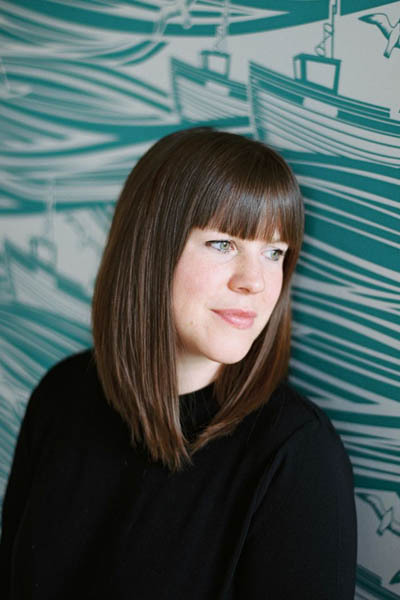 She is a mid-century modern enthusiast and a blogger on design issues herself (ecomodernstudios.wordpress.com). She manages several part time jobs as well as two pre-school children and the extension project, so she is really stretching herself right now. Indeed she always has; in her early twenties she went on her own to India and worked on a newspaper and also worked in a school set up for street children. She arrived home with just the clothes she was wearing and went on to build a varied career with start-ups and creative companies. At home she has a wonderful talent for achieving maximum design impact with minimal money, but winning this prize would really make a huge difference – and couldn’t happen to a lovelier or more deserving person! Hi there, I’d like to nominate my youngest daughter, Megan. Meg is a dog groomer and spends all day, every day working hard to make other people’s dogs look beautiful, so much so that she never has time to think about her own house! I’d be so thrilled if she had the chance to be spoilt herself for a change as she’s always thinking about other people. But how to choose? Thanks for doing this, Katy, DFS really seems to have come into the 21st century with a vengeance, well worth checking out. I nominate my very inspiring mum, who has always put her children first. I would love to nominate my daughter Emily, she really deserves this prize, after saving hard to buy her own flat, she doesn’t have much left to spend on furniture! So her interior consists of hand me downs from family members, she would absolutely love this prize I know! She is kind, caring, beautiful and absolutely selfless, always puts others first, she’s been through a stressful time recently, so would be a very deserving winner. Happy International Women’s Day! Emily you are an inspiration to us all! My lovely mum sandra. She is a creative person who appreciates good design. The first look is very her, stylish, crisp and clean, it would be such an amazing surprize to win this for her! I would like to nominate our MD, Cristina for a free makeover. She is about to move to a new flat that is unfurnished , however she is working incredibly hard on taking our company to the next level and has very strict deadlines in the next 4 weeks and has no time to organise furnishing for the new flat. My concern is that she may just move in and live in an empty apartment, as she tends to, and has got to put the business first. She is quite elegant and stylish and looking for a fresh start! She is quite inspirational too, having built an award winning product ( a patient management system for dentists that has won the prestigious Innovation Awards in 2015), a nice to work for company and a wonderful and caring team; all of this with very little resources and in a very short period time. That is why, she would really deserve some help in creating a new home. Thank you. What a great giveaway! I’m going to nominate my best friend and sister in law Louise who is one of the kindest, most thoughtful, selfless people I know who has faced some real challenges in her life and never once complained. I’d like to nominate my lovely wife Lucy who’s worked so hard to make us a family home since we moved into a wreck of a victorian townhouse that didn’t even have a kitchen. The lounge really gets her down as it was thrown together from pieces we had leftover as a new baby arrived and funds ran out. A surprise makeover would cheer her up so much. I thought of her as soon as I saw the gorgeous pink sofa – her favourite colour, she’s even painted our front door that same pink! Oh! I LOVE the mid century modern – it is beautiful! I’d like to nominate my Dad – he’s devoted every day of his working life to serving his local community and makes do with very little. I know he’d love different furniture and to be more comfortable at home but he’d NEVER mention it. Your picks are ALL amazing! Love them. I would like to nominate my wonderful sister whose little twin girls and visually impaired husband have destroyed the sand-coloured, linen sofa set she so foolishly bought before the girls were born. She works so hard to raise her little girls and deserves someone to do something for her for a change. She loves interior design and would love to live in a home that she can enjoy and be proud of. Thanks. I am absolutely going to nominate my mother. For four reasons … one, her greatest achievement in life was teaching me (and my two brothers) how to mix the perfect gin and tonic … two, she has very strong opinions on the cashmere to wool ratio in cashmere blend clothing … three, she makes sure the animals in her home are fed before any human … and four, she has the most horrendous taste in homeware so needs all the help she can get. She claims she’s colour blind but I think that’s merely to hide her bad choices (green carpet and burgundy leather sofa). Help her, Katy, help her!! I’d like to nominate my sister. She’s the kindest most warm hearted person I know and just spending time with her makes me want to be a better me! She never has a bad word to say about anyone and she reminds others to be kind about people whenever they ‘slip up’! Dispute all this the universe has not been kind to her in return, she was diagnosed with Crohns disease over ten years ago and has fought to live a normal live ever since, despite being in pain on a daily basis. She’s dealt with all the drugs and operations by changing her lifestyle and trying to look after her self as best she can. 4 years ago she married the most lovely man and they been trying to have a baby ever since, but her body is struggling even further under this added pressure. Everyone knows what amazing parents they’d be and it is simply not fair that they are not getting this opportunity to share the love they have with a child. They’ve had so much heartache that they deserve something nice to happen to them. Who knows it might start a chain of ‘good’ things happening for them…. I do hope so! I want my Auntie to win cos she is the best auntie ever! Posted and supported by Maxies Dad! I nominate my daughter, Amber, who’s recently been through a high-risk, very traumatic pregnancy, to present us with the most adorable baby grandson. She’s only 21, yet she and her loving partner are both hard-working, appreciative of their lifestyle and will make wonderful parents to baby Oscar. When she returns to work, hubby and I will share childcare with Cam’s Mum so that the kids can pay their bills and save for a deposit to buy their own house. They are a lovely couple and we have a close-knit family, but they really would love to have a lounge makeover treat, as all their future monies after bills and saving, will go on Oscar’s needs. They’d consider new furniture an extravagance and most of theirs is second-hand, so this would be wonderful for them! I nominate my inspirational sister-in-law, Joanne. She was a young mum raising her daughter mostly alone (support from grandparents) that went back to school during the nights to achieve an advanced degree. Her daily job involves supporting families in the community and she continues to study to finds additional ways to support children and their parents. She hopes in a couple years to become a foster mum or open her home to support young pregnant mums. She is the most nonjudgmental and caring person I know. She is also currently training for long distance walks for charity. She raised an inspiring daughter who is training to be a teacher and supports afternoon schools programs for children. Joanne would be very deserving of living room with beautiful DFS furniture. She would be thrilled to show her “before” and “after” room. Thank you DFS and Katy for generosity. I would like to nominate my Sister Jayne who has been my lifeline during the last year when I have become a single Dad. She has helped me and my boys through very difficult times and I don’t know what we would have done without her. We have always been close, but its only times like this you realise how you sometimes take people for granted. THIS GIVEAWAY IS NOW CLOSED! WINNER WILL BE ANNOUNCED HERE ON WEDNESDAY 23RD MARCH AT MIDDAY.